Click the blue links below to view my tips-and-insights page and photo on each of these four medal winners. You see a mighty volcano erupting relatively close to you. You explore one of the world's most diversified fauna and flora preserves. You sunbathe on beautiful tropical beaches and take interesting trail hikes into a lush, wildlife-rich rainforest. You experience a cloud forest firsthand as you walk up on an easy-to-hike trial. It was Columbus in 1502 during his fourth and final voyage. 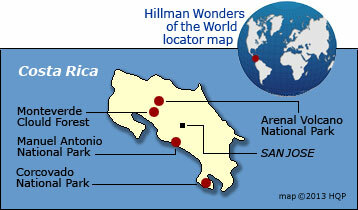 There are seven active volcanoes and over 100 dormant ones. Bananas and coffee top the list. Tourists are number one. Retirees from Canada and America are also major sources of foreign money. Costa Ricans call males "Ticos" and females, "Ticas". The country is heralded by environmentalists around the world for its staunch dedication to preserving its biodiversified flora and fauna. Costa Rica has not had an army since 1948 when President Ferrer abolished the army to prevent the possibility of future military coups (which have been common in Central America).